In order to address the global legislation issues for Anti-Money Laundering (AML), Anti-Terrorism, the USA PATRIOT Act, Office of Foreign Assets Control (OFAC), Bank Secrecy Act (BSA), and other global governmental regulatory requirements, Patriot Techcorp has developed the Global Patriot™ program. As intelligence is gathered from the pertinent sources the data is correlated into a structured file database located within a central repository that is securely managed by Patriot Techcorp. 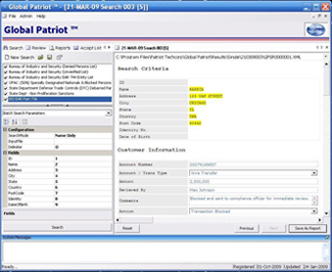 The Global Patriot™ program data files contain a plethora of informational inputs ranging from identification fields such as First Name, Last Name, Aliases, Date of Birth, Place of Birth, Passport and other Identification Numbers, Addresses, and other applicable information as provided by the associated issuing agency and/or organization. Global Patriot™ is currently available as a Windows application. Future release versions will include the Web, Multi-Batch and .DLL versions. Standard Package Includes data files from a pre-selection of ten (10) available data sources. Premium Package Includes data files from well over twenty five (25) available data sources. In order to download a no-obligation, 10-day trial evaluation version of the Global Patriot™ program, please submit your requests via the above listed contact reference point.